Obtaining evidence abroad can be difficult for any litigant. It requires clearly defined evidentiary goals, as well as a strategy for achieving those goals. Since most US attorneys have never had to take evidence abroad, many lack the experience to develop such a strategy. That’s why Legal Language offers customized monographs for any country where you need to collect evidence. Our comprehensive, country-specific monographs are designed as a reference tool and serve as a valuable source of information for attorneys gathering evidence abroad. Taking evidence in Germany is challenging under the best of conditions, requiring large expenditures of both time and money. Regardless of the method used to take evidence in Germany just one request for documents or testimony can add months of delay to discovery. 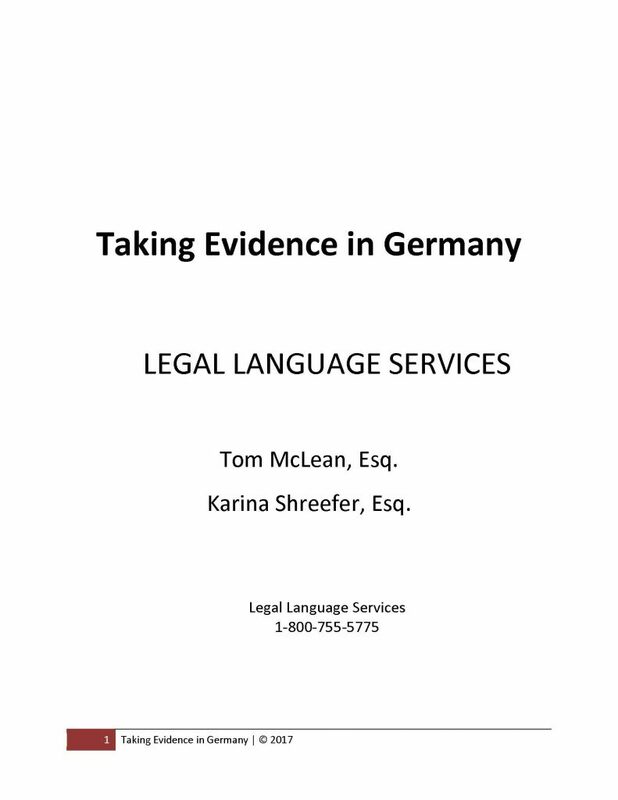 As for expenses, attorneys contemplating taking evidence in Germany should be prepared to spend $20,000 or more. This means that the evidence sought in Germany should be valuable to the case without being dispositive – because, as we’ll explain, if the evidence is truly dispositive there may be grounds to dismiss the case for forum non conveniens. Germany is a civil law country. Chapter 2 provides an overview of how a civil law system functions. Chapters 3 provides a comprehensive review of taking evidence in Germany pursuant to the Hague Evidence Convention; chapter 4 provides a comprehensive review of taking evidence pursuant to the Federal Rules of Civil Procedure. Both methods have their advantages and their drawbacks. Attorneys should select the method for taking evidence that is most likely to meet their goals. Chapter 5 provides a brief summary of the pros and cons of taking evidence under either the Hague Evidence Convention or the Federal Rules of Civil Procedure. In order to take evidence in Germany under the Federal Rules of Civil Procedure, a court must have personal jurisdiction over the defendant or witness. Accordingly, the court must have a constitutional basis for asserting jurisdiction, a statutory basis for asserting jurisdiction, and a finding that service of process was proper. Because the constitutional basis is a major issue when evidence is sought from a non-party witness under the Federal Rules, we review the constitutional basis for personal jurisdiction in the section on taking evidence from non-party witnesses. Throughout the text we will assume that there is always a statutory basis for asserting jurisdiction under a state statute. However, strictly speaking, this assumption is not always true and hence may require some research. Legal Language Services has been providing attorneys with international litigation support since 1983. LLS is considered by US attorneys and overseas Central Authorities to be the premier organization for facilitating international service of process both in conformance with the Hague Service Convention and non-Hague protocols and treaties. LLS attends the Special Commission Meeting at the Hague Conference and the Hague Conference itself under the aegis of the US Department of State.